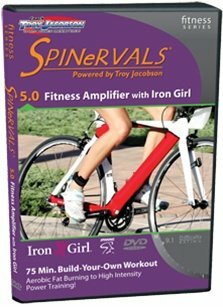 Spinervals 5.0 Fitness Amplifier with Iron Girl will whip you into shape. This DVD will introduce you to the joys of indoor cycling and interval training and take your fitness to the next level. Build your own workout choosing from:TechniqueAero Base Builder Aerobic Endurance Threshold Sprint Compatible with all stationary bikes and trainers Music on/off option75 minutes Difficulty level: 8.9New.